There are a number of important factors to take into account when selecting the best place to install a carbon monoxide detector, and I will take you through the process step by step. If you're like most people, you tend to 'skim' information on the web - don't do it this time - please read all of this information about where to install carbon monoxide detector carefully; after all when you consider that throughout the developed world Carbon Monoxide is the single largest cause of accidental poisoning, lives are depending on it. If your home has several levels, including basements and any attics that are used, then you will need detectors on each level. The reason for this is that a dangerous build up of CO gas will often be trapped within a single level of your home. Your main living level might be quite safe, but you might go down to the basement only to receive a dangerous dose of Carbon Monoxide because you failed to have a detector there - don't make this mistake. As is the case with smoke detectors, you want your CO detectors to wake you during the night if something goes wrong. This means that the most important place is near your bedrooms. I recommend that you have a carbon monoxide detector within 15 feet of each bedroom door, 10 feet is even better if you can afford more detectors. If two bedroom doors are 30 feet apart or less, then place one in the middle. If however they are more than 30 feet apart you will need more than one detector. If you have an enclosed garage directly attached to the home, then you should also place a detector within 10 feet of the internal door to your garage. If a motor vehicle is left running in the garage, then a dangerous level of Carbon Monoxide can quickly build up inside your home. You should also place a detector in any room situated directly above your garage. You must ensure you get your carbon monoxide detector installation height right. While some guides might recommend placing your detectors on the ceiling, I don't agree. The specific gravity of Carbon Monoxide is 0.9657 (with normal air being 1.0), this means that it will float up towards the ceiling because it is lighter than regular air. However, when a build up of dangerous levels of CO gas is taking place, this is nearly always due to a heat source that is not burning its fuel correctly (motor vehicle exhaust fumes are an exception). This heated air can form a layer near your ceiling which can prevent the Carbon Monoxide from reaching a ceiling detector. For this reason I strongly suggest that it is best to mount your detectors on the walls at least a couple of feet below the height of the ceiling. If your detector has a digital read-out, then I recommend placing it at about eye level so you can easily read it. 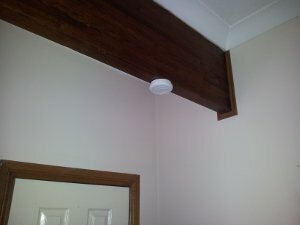 Or if you have some other structure, like the exposed beam in this photograph insdide my house which is positioned below the ceiling level, then you can attach your carbon monoxide detectors to it instead. You can get a brief description of the legal requirements for each state above from the National Conference of State Legislatures. See our report on the best carbon monoxide detectors for home use.